This weekend is the Social Computing 2009 conference in Vancouver, B.C. It is a gathering of many people doing research on social media useage. Many papers are about tagging systems, blogs, wikis, message boards, and social networking services. Bonsignore, E.M., Dunne, C., Rotman, D., Smith, M., Capone, T., Hansen, D.L. & Shneiderman, B. 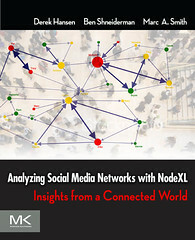 (2009), “First steps to NetViz Nirvana: evaluating social network analysis with NodeXL”, In SIN ’09: Proc. international symposium on Social Intelligence and Networking. IEEE Computer Society Press. Smith, M., Hansen, D., Gleave, E. (2009) Analyzing Enterprise Social Media Networks in SCA’09 Proc. International Symposium on Social Computing Applications. IEEE Computer Society Press. Abstract: Broadening adoption of social media applications within the enterprise offers a new and valuable data source for insight into the social structure of organizations. 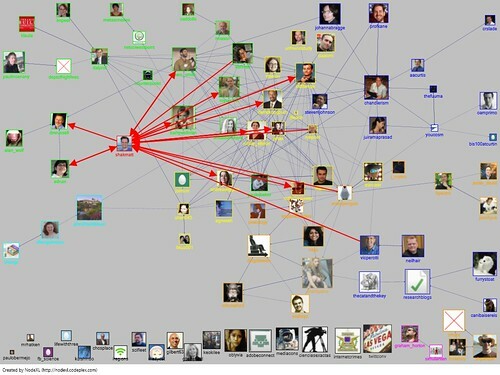 Social media applications generate networks when employees use features to create “friends” or “contact” networks, reply to messages from other users, edit the same documents as others, or mention the same or similar topics. The resulting networks can be analyzed to reveal basic insights into an organization’s structure and dynamics. 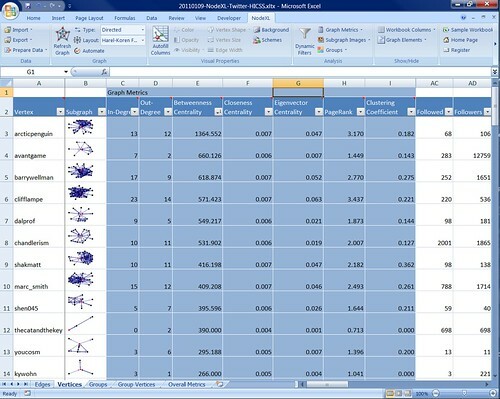 The creation and analysis of sample social media network datasets is described to illustrate types of enterprise networks and considerations for their analysis. Welser, H. Gleave, E., Smith, M., Barash, V., Meckes, J. (2009) “Whither the Experts? Social affordances and the cultivation of experts in community Q&A systems”, in SIN ’09: Proc. International symposium on Social Intelligence and Networking. IEEE Computer Society Press.